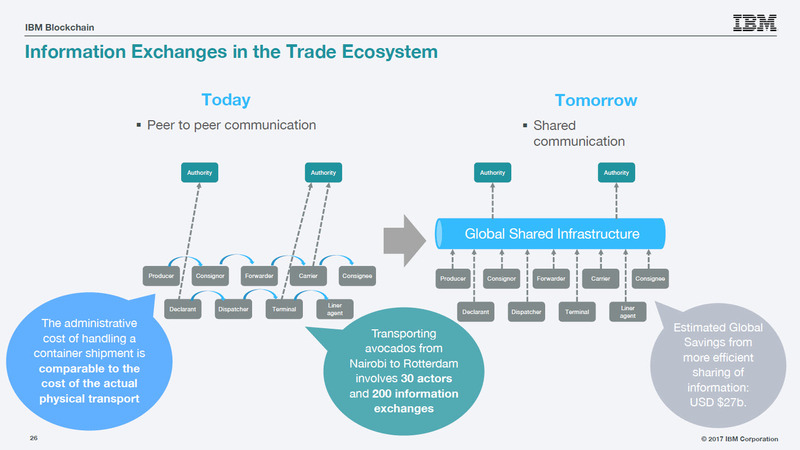 Trade finance is losing billions through inefficient manual workflows and lack of transparency. 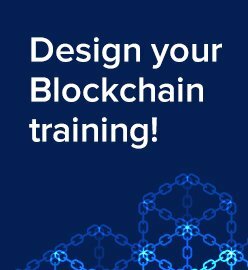 Learn how blockchain drives digitization to save on expenses. How to apply blockchain technology to transforming cross-border supply chain was the topic of a recent webinar delivered by Sloane Brakeville of IBM. Trade finance is the process, by which importers and exporters mitigate trade risk through the use of financial institutions that serve as trusted intermediaries. As Sloane explained, these intermediaries provide assurance to sellers (in the event the buyer doesn’t pay) and contract certainty to buyers (in the event that goods are not received). Payment and delivery terms are documented in a letter of credit or open account contract vehicle, and the financial institutions receive fees for assuming risks, as well as for documentation and oversight of payment terms. About 80% of trade is supported by some sort of finance, Sloane said, with letters of credit facilitating 47% of global trade finance. This percentage adds up to $2.8 trillion per year worldwide. The above-mentioned inefficiencies result in error-prone or incomplete/inconsistent information, border delays, and lack of shipment visibility. 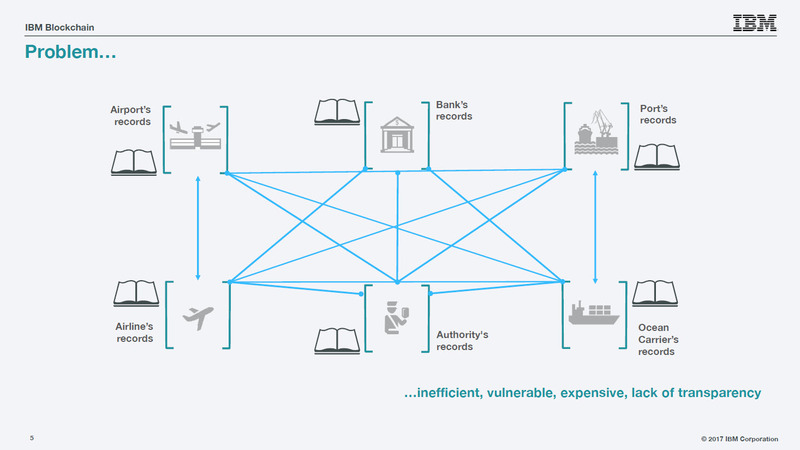 According to Sloane, trade-finance and supply-chain systems that operate without blockchain are inefficient, vulnerable, expensive, and lack transparency. Each participant in this network has its own share of problems. Consensus. 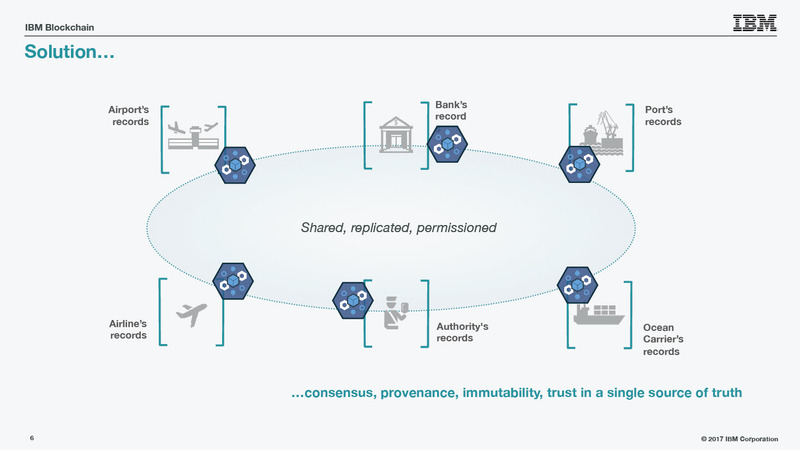 All ledgers in the network are kept in sync and all agree to the whats and whens of a transaction. Provenance. There are records of where each asset has been. Immutability. Anything written on the ledger cannot be undone. This means you cannot delete records and you cannot insert them halfway through the blockchain. Finality. Anything written in the blockchain cannot be disputed. Blockchains also help reduce the influence that some validating participants have in long-established supply chains. In this scenario, the decentralized aspect of a blockchain mitigates the potential of a monopoly. With 20 million or so containers afloat at any given time across the oceans of the world, transporting more than $20 trillion of merchandise over the course of a year, smoothly running trade-finance processes are essential to keep things moving. 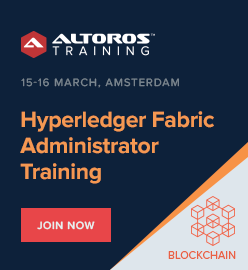 To address the issues of inefficiency and to provide optimal document workflow, IBM partnered with Maersk to put the process on a Hyperledger Fabric blockchain. (The announcement was issued earlier this month.) The partnership known as Global Trade Digitization (GTD), aims at providing support for physical document scanning and maintaining compliance with SWIFT, the global interbank financial transaction network. According to IBM, the GTD is a global, cross-border supply chain based on Hyperledger Fabric. It will help to manage and track the paper trail of tens of millions of shipping containers across the world by digitizing the supply chain process from end-to-end. Thus, it is supposed to enhance transparency and enable the highly secure sharing of information among trading partners. Ships often “have no idea” what they’re carrying. Bills of lading do not properly describe goods and the parties involved. The owner of the goods does not have sight of the goods. 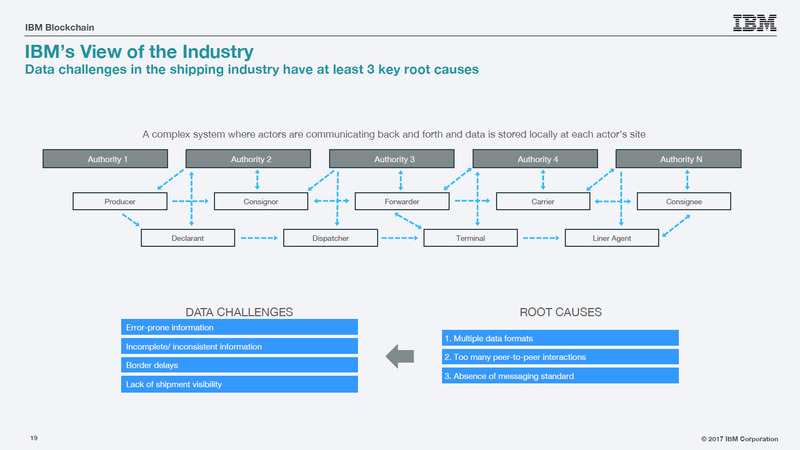 Risks along the supply chain are introduced when there’s a lack of data. There’s no link between trade finance and physical movements. Data must be re-introduced at many steps along the way. A lack of accurate data impedes multi-modal transport (moving goods from ships to pallets to trucks, etc.). The GDT platform is developed to enable real-time status visibility of each shipment, reduce fraud and errors, improve inventory management, eliminate delays, etc. Intended to be integrated with already established trade systems, the GTD looks to provide trusted, tamper-proof, and cross-border workflows for digitized trade documents. 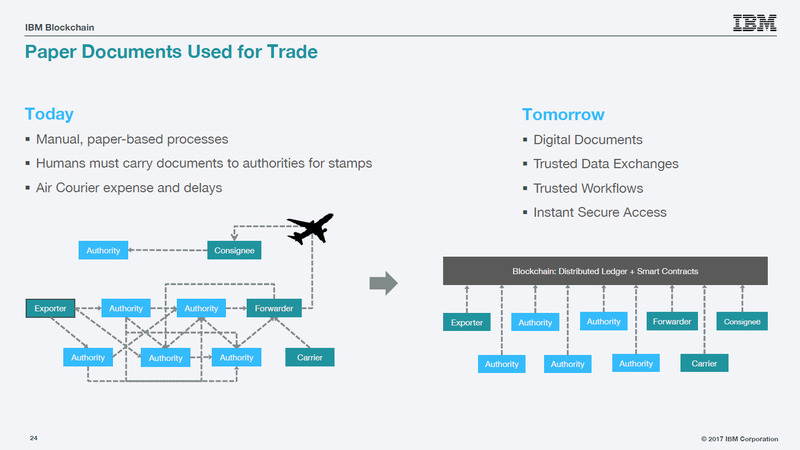 The following slide illustrates how blockchain streamlines the process of sending and receiving paper documents used for trade by bypassing the cost of couriers, digitizing manual and paper-based processes, and reducing delays. In the following scenario, the GTD improves visibility with blockchain through a shared communication network. The new system reduces the number of processes and actors to efficiently exchange information. 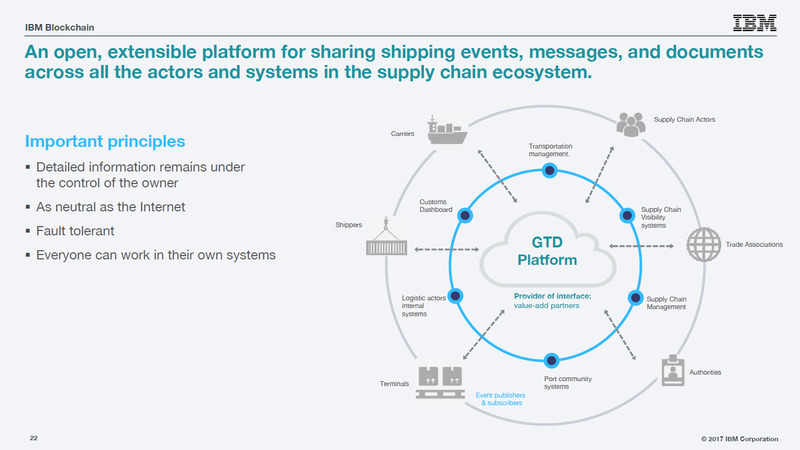 Expected to be widely available later this year, IBM and Maersk believe that GTD can save the trade finance industry billions of dollars. Want details? Watch the webinar recording! Sloane Brakeville is a member of the Blockchain Labs at IBM. 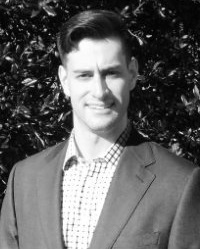 He helps clients to grasp how to apply the blockchain / distributed ledger technology to prepare for the oncoming decentralization revolution. 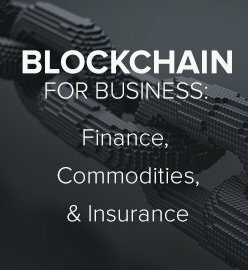 Working with IBM Blockchain and Hyperledger, Sloane has helped to build blockchain projects that have tangible impact in the financial services, trade finance, media, entertainment, and supply chain industries. 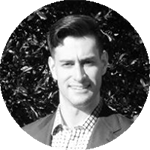 Notable ventures he has been engaged with include the HSBC and Bank of America Letter of Credit project, and a major Canadian Bank Proof of Concept demonstrating the capacity of Hyperledger to show consolidated credit risk of customers. This post was written by Roger Strukhoff and Carlo Gutierrez.